Mustard Evening Primrose is a member of the Evening Primrose Family. The plant grows to 3 feet in height and has gray-green arrow-shaped, hairy leaves that grow to 2 inches in length. The plant typically grows in washes and desert flats at elevations below 4500 feet. 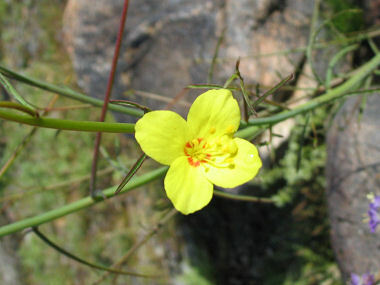 Mustard Evening Primrose bears a resemblance to members of the Mustard Family. Mustard Evening Primrose blooms between February - June and produces yellow flowers with 4 petals which often have a circle of pink at the base of the petals. Flowers are followed by a long, narrow, mustard-like seed pod to 2.5 inches in length.